Woohoo, I finally bought it!! I finally bought it!!!! I know I'm like hm, 4-5 months late but ... woohoo, I bought it~~~~ Haha. So what exactly did I bought ... well it's 《孙燕姿2005飞跃红馆演唱会》 YanZi Live In Hong Kong 2005 DVD!!!! =) =) =) =). Oh, on the top in the photo, it's just an advertisement card from SK Jewellery lol, nice XD. Hm, alright I got it from Causeway Point's CD-RAMA for S$26.90 =). If you haven't bought yours, I ADVICE YOU TO GET IT NOW!!! XD It's great, fantastic, heavenly ... it's like I'm back in the Singapore Indoor Stadium, 14th Jan 2006 XD. 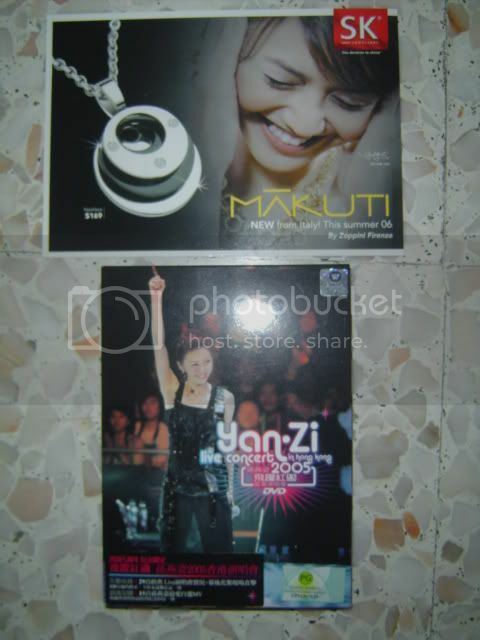 I love it when YanZi sung 'Wo Bu Nan Guo', so much feeling inside, even she thinks so =).